Robots have been the subject of many a science fiction novel or movie. The idea of having robots help humans enjoy more convenient lives is nothing new. For many of us, though, the dream of having robot house help is far from being a reality. For Henry Evans, a mute quadriplegic, science fiction is becoming reality. He got hold of a PR2, a two-armed wheel robot developed by Willow Garage, a robotics research lab and technology incubator. Together with robotics development platforms, this company also works on robot operating systems. For the past 10 years, Evans has been unable to do many things that you and I take for granted. Thanks to the collaboration of Willow Garage and Georgia Tech’s Healthcare Robotics Lab, the PR2 is helping Evans live a more independent life in spite of his physical condition. Men – you probably dislike the chore of having to shave every so often. For people like Evans, being able to shave one’s self is a dream. And imagine this – prior to having the PR2, Evans was not even able to scratch when he felt an itch! I don’t know about you, but that would be pure torture! Thanks to PR2, for the first time in 10 years, Evans was able to scratch an itch himself. Here is an inspiring video about PR2 and what it can do. This development is made possible by a project called Robots for Humanity. ((Willow Garage Blog)) The collaborators are mainly using PR2 and researching ways by which this particular robot can help disabled people live more independently. 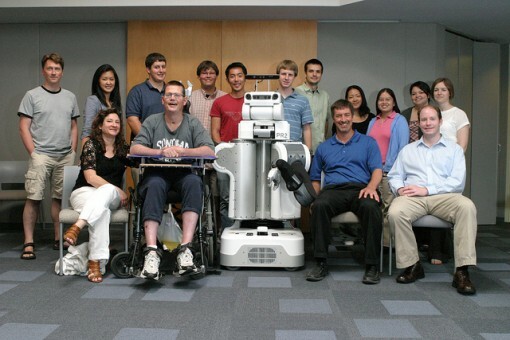 The ultimate goal of the project is to be able to make robots accessible to people who need them most. As they say, Evans is only the beginning. I applaud Willow Garage and Georgia Tech’s Healthcare Robotics Lab for their efforts and for focusing on a group which really has the need for robotic assistance in the home. While it is cool for those who have no handicap to have a robot assistant (I wouldn’t mind having one! ), the idea of helping those in need first is admirable. It’s one of those moments when you really really wish that a concept were fully part of reality and not a thing of science fiction.